Just this week, G-Star have revealed their RAW for the Oceans Collection for Autumn/Winter 2014. The collection, which was curated by American musician/fashion designer/nice guy/hat wearer Pharrell Williams, is made from ground-breaking Bionic Yarn. Well, this is news. Not only have G-Star collaborated with the one and only Pharrell Williams, they’ve also added a touch of innovation. Bionic Yarn is an eco-thread of fibres derived from recycled plastic bottles. G-Star are doing their thing for the environment by creating sustainable fashion. Their first collection alone recycled over 10 tonnes of plastic collected from the ocean. This range signifies the start of a long and beautiful collaboration between G-Star and Bionic Yarn. So what does the collection actually look like? It features a selection of t-shirts, hats, hoodies and jeans for both men and women. Pharrell has managed to design an eco-friendly collection that actually looks good. He favoured earthy tones throughout the line of fashionable basics with shades of indigo blue and black appearing frequently. 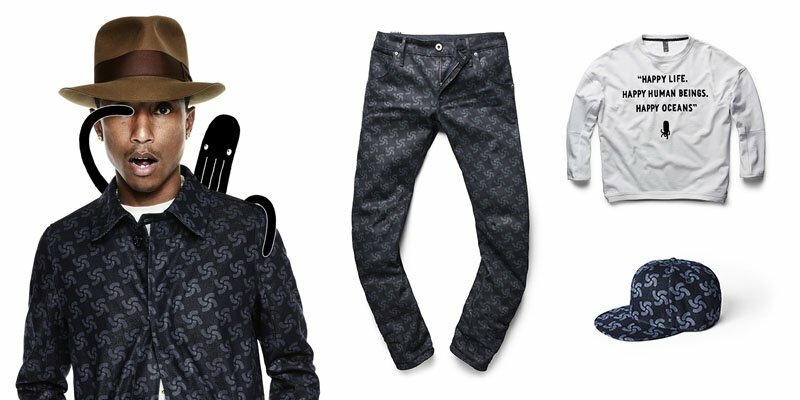 The Bionic Yarn denim has been printed with an original pattern that features the initiative’s mascot, Otto the Octopus. Usually, everything Pharrell Williams touches turns to gold. In this case, everything Pharell Williams touches turns to Bionic Yarn. The RAW for the Oceans Collection will hit stores in September 2014.